(CNN) – Republicans scored big in Wisconsin Tuesday when Gov. Scott Walker fended off a recall vote, but Democrats appeared to eke out a victory in the state senate, where local news organizations reported Democrats taking control after winning their own recall attempts. Four Republican senators faced recall votes Tuesday. At least three held on to their seats, but former Sen. John Lehman, a Democrat, declared victory in ousting incumbent Sen. Van Wanggaard. 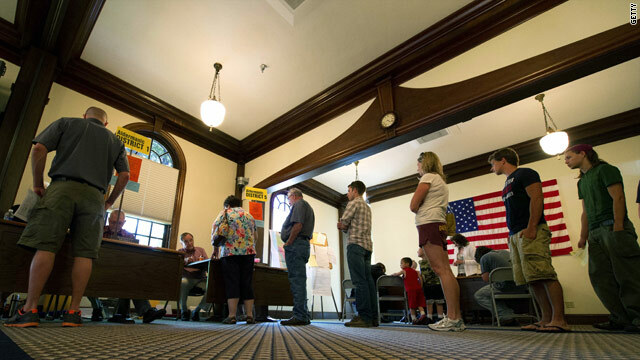 The vote was extremely close, and results have not been certified, CNN affiliate WTMJ reported. "It is clear that we won the 21 district," Lehman told cheering supporters. Meanwhile, Lehman's challenger, Van Wanggaard, refused to concede. His spokesman told the Milwaukee Journal Sentinel the campaign would wait for results to be examined before making any decision. "We owe it to all of Senator Wanggaard's supporters and the voters of Wisconsin to thoroughly examine the election and its results and act accordingly once we have all of the information," Justin Phillips told the newspaper. The Wisconsin legislature will be out of session until after the general election in November, when 16 of the body's 33 seats will be up for grabs, meaning any new Democratic majority would be fleeting. On CNN Wednesday, Democratic Wisconsin Rep. Jon Erpenbach said the results in Wisconsin presented a "mixed message." "Obviously it was a tough night for Democrats. At the same time, Wisconsin Democrats in the State Senate picked up a seat so we have control in the State Senate so it's mixed messages last night," Erpenbach said on CNN's "Starting Point with Soledad O'Brien." Great news. I hope they hamstring Walker and that nothing gets done in the state until the end of his term.. Sounds like a page out of the GOP playbook, doesn't it. He is a lame duck from here forward. What a joke. "Democrats appear to take Wisconsin" ??? I think there was one Senate that a Democratic incumbent had lost to a Republican, giving them control. I think that this was that seat, and the former incumbent won the recall over his previous opponent. Nice going Wisconsin, "You middle class repubs really " Shot yourself in the foot!!!!! What a bunch of self destructive Morons!!!! Hope you love minumum wage???? LOL You would think Women would vote against repugs,your rights are being "Diminished" Good luck with equal pay now!!!!!! Sad to see that people of this country let money buy their votes. That should slow down the Koch brothers agenda in Wisconsin. Maybe those power plants will not be given to them after all. Democrats trying to spin their Wisconsin DISASTER into something positive by claiming they won something that they have not officially won yet. And these State Senator's aren't even in session so just what the heck is the point? More taxpayers money WASTED by the Democrats. It seems to be the ONLY thing they are truly good at. Why wouldn't Romney praise him. It's just a start to crushing the middle class. Hopefully, that will neuter Walker, so he can't do as much damage. Of course, if it leads to total gridlock (like U.S. Congress), that is not a good outcome either. Even though I lean more to the right, I see the Dems taking the senate as a positive thing, One party having complete control is usually not in the peoples best intrests. Results not verified = Dems appear take Senate? Come on guys, misleading titles should be the first thing editors fix. They had to get something after all of the corrupt union money was dumped. Did you notice that the precinct where Jesse Jackson "campaigned" had a vote total tht registered 119% of the registered voters in that precint. There are those unions doing what they do best theft and fraud. The Democrats may get one seat in Wisconsin for now. The writing is on the wall and the remaining Democrats in the Senate may be up for election in November 2012 better understand their jobs are on the line; they will be replaced.